Because the few days of sunny mild (10°C) weather has pushed many of the frits above the gravel I have decided that I cannot hold them back any longer so it is time to water. I watered the plunge sand and into the pots that are showing growth. Every year I find that it is the same frits which push through first but they are not the first to come into flower. If you look you will see the buds on Fritillaria yuminensis but they develop very slowly and will not open until April. I can already see the yellow flowers on Fritillaria chitralensis and expect them to be open in early to mid March depending on the temperatures we get - as I write the temperature is plummeting down below zero centigrade. I just love these egg sized buds of Fritillaria sewerzowii as they push through. 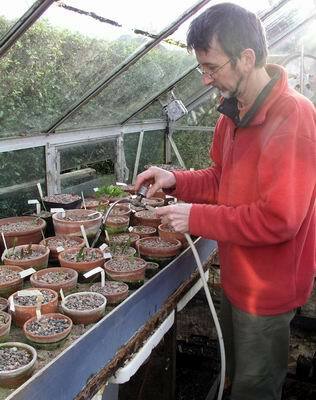 We grow several forms raised from seed, some wild sourced and others from the Seed Exchange. 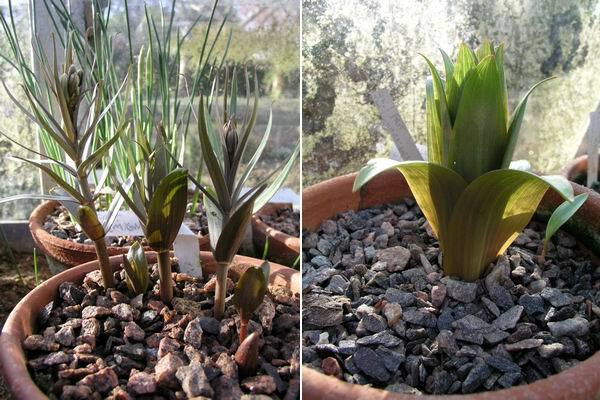 The form above is obliging in that the bulb splits on a regular basis so we have a nice big pot full of it. Others, like this one I received from Janis Ruksans, Fritillaria sewerzowii 'lilyflora' seedling are not so willing to split but you can see that I have sown the seed into the same pot and it is germinating nicely. These monocotyledon seedlings have a nice wide leaf and I hope that the resulting plants share the very large flowers of the parent bulb. 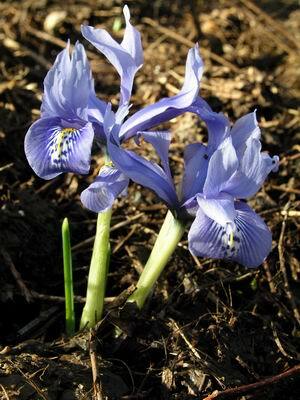 Into the garden now, where always among the first to make a grand display is Iris 'Katharine Hodgkin'. Despite its delicate appearance it is such a tough little iris, surviving all the cold and snow that our climate may throw at it. 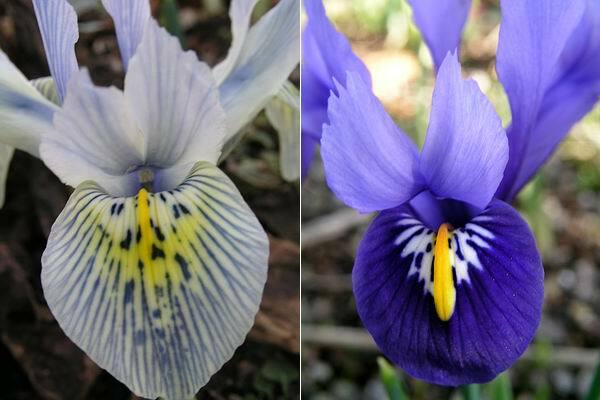 Here in close up are (left to right) the flowers of Iris 'Katharine Hodgkin' & I. reticulata, just to highlight the beauty of their markings. 'Katharine Hodgkin' makes lots of rice grain offsets around the parent bulb and these are best removed and scattered around the beds when you split the clumps every two or three years. If you leave them too long the clumps get very congested and you do not see the beauty of the flowers so well since they cannot expand without squashing into their neighbours. I like them best planted out individually but that is a lot of work which needs done every year and with the very good rate of increase I would also need a bigger garden. 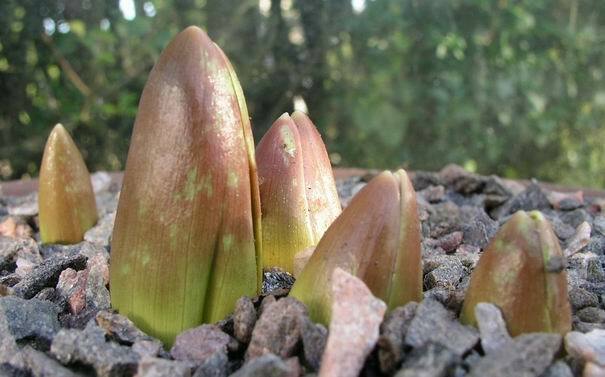 I remember that Iris histrioides major used to be quite a common plant, especially among rock gardeners, but not so now it is hardly ever seen. I received a small offset from the late Eric Watson about four years ago. Last year we had a single flower and now we have two, so fingers crossed for a nice patch in another few years. It is the time of the spring flowering crocus. As we have so many in flower just now, mostly under glass, it is difficult to choose which to show in the log. 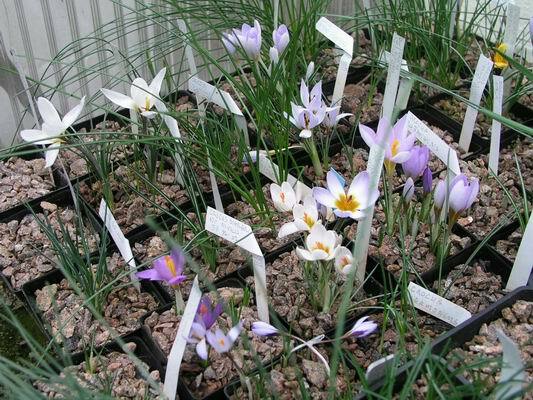 Janis Ruksans offers a number of hybrids between Crocus angustifolius & reticulatus and if they are all as good as the one we have, C. 'Janis Ruksans' then they are worth having. However being a true cannie Scot and an Aberdonian to boot I intend making the cross myself. I have both Crocus angustifolius (left) and C. reticulatus (right) and have transferred the pollen between them so I hope to get the cross both ways. Crocus biflorus nubigina left (which I showed in log 5) is a given sub specific status because it has black anthers here I show (right) a form of Crocus biflorus isauricus which also has black anthers. It is one of a pot of seed raised plants that stands out from the others (to the rear) because of its black anthers and bluish tepals. 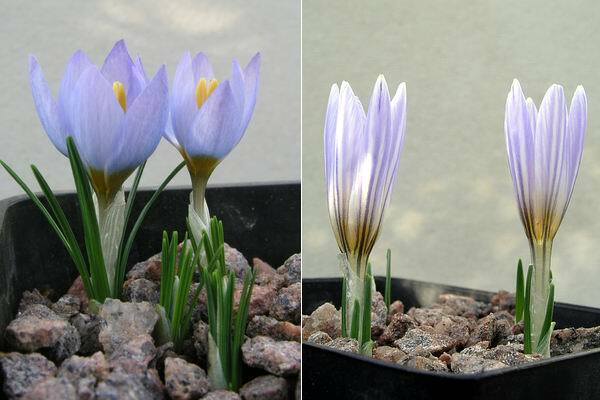 One of the finest blues of the entire genus has to be Crocus abantensis (left) with its dumpy chalice shaped flowers. 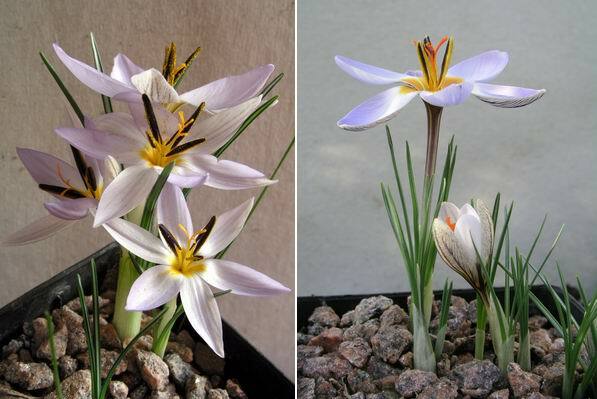 Just to show that the flower shape varies as well I compare it with Crocus aerius (right) which has narrower straight sided flowers with blue stripes. It is also worth noting that both these species have yellow throats a common diagnostic feature that is used in defining some of the species of crocus. 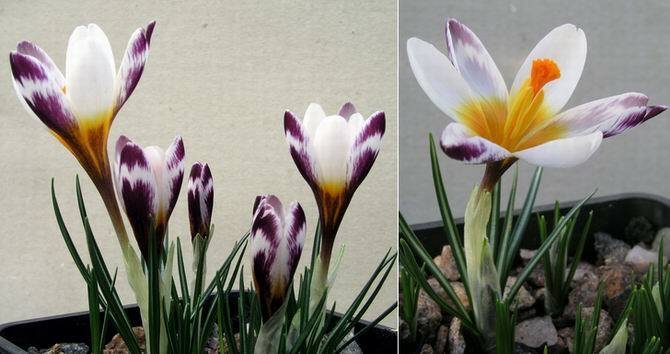 Finally this week my favourite form of Crocus sieberi sieberi with dramatic markings on the tepals and a crazy expanded frilly style. 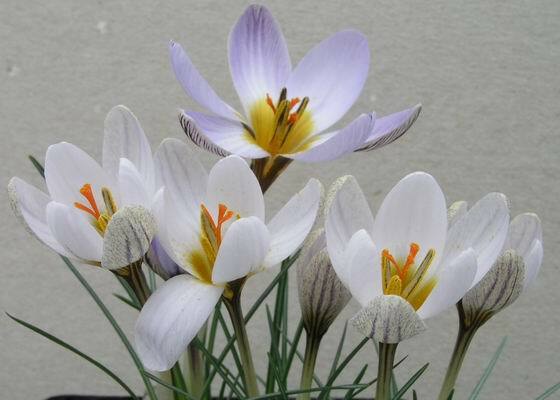 If you have not yet visited the Crocus pages on the forum you should go there right now as Tony Goode, who holds the UK National Collection of Crocus, along with several others have made some great posts of crocus pictures. 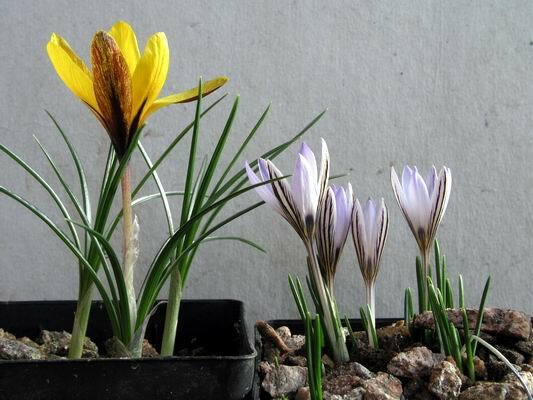 It is less than two weeks now until the Early Bulb Display at Dunblane on the 19th February. I am giving two talks there ; 'Fritillarias' in the morning and 'Bulb log live' in the afternoon. I hope to see some of you there.